2016 Ducati 1299 Panigale. Picture credits - Ducati. Submit more pictures. The opening and closing of throttle butterflies on the Superquadro is controlled by a fully electronic Ride-by-Wire system. The absence of a mechanical connection between the twistgrip and the throttle bodies allows the engine ECU to regulate power delivery by directly adjusting the throttle; Ride-by-Wire makes it possible to have different power and delivery based on the selected Riding Mode, to alter the level of engine back-torque (EBC), and to control any slipping of the rear wheel (DTC). Ask questions Join the 16 Ducati 1299 Panigale discussion group or the general Ducati discussion group. Bikez has reestablished Bikez.info motorcycle web shop overview. Here we present the major online shopping possibilities for motorcycle parts, gear and accessories. This includes customizing and insurance. Search and compare products and prices. 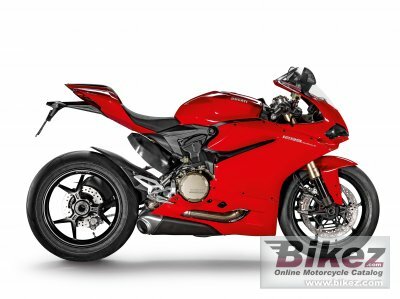 Try our 2016 Ducati 1299 Panigale discussion forum if you have questions or comments. Information about any technical issue is always welcome.